I bought the Eduard kit straight from Eduard as I needed a bit of PE that I couldn't find in Australia a couple months ago. the postage was almost the same for one PE fret as it was for one PE fret and two Eduard 109's. Here in Australia the Eduard Profipack 109's retail at about 55$ AU. The Eduard Weekend Edition 109's about 34$ AU. And, the Big T 109 comes for a lofty $69 AU. I bought it at Hobbyco Australia who shipped it postage-free. Cool. There are never enough '109's, at least as far as I'm concerned. I've yet to read anything abut the Tamiya kit, but I imagine it's killer. 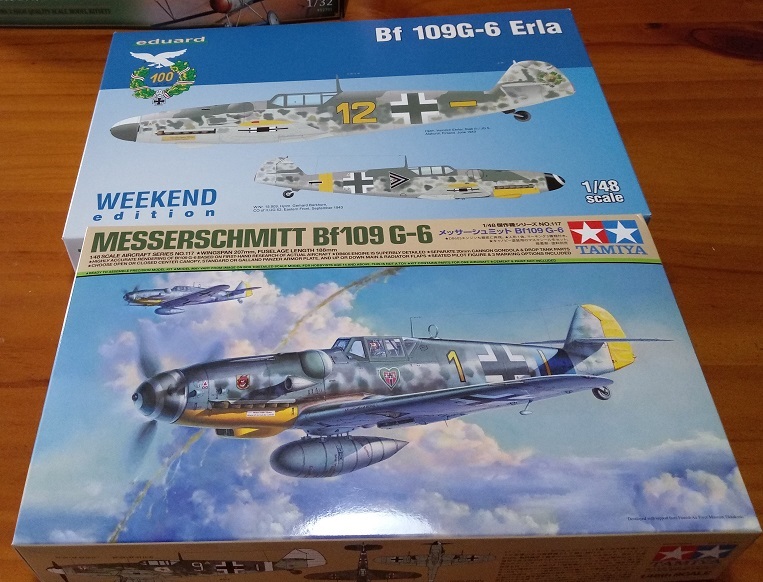 The Tamiya Bf 109 G6 is about $35 (AUS) from my man at Tokyo Hobby on Ebay. He's in Osaka, Japan. Shipping might not even be that long from Japan to Australia. Next time, maybe try him out! I'm anxious to see what you do here! This new 109 from Tamiya has may name all over it. Killer indeed! The kit basically falls into place. Only blemish is Tamiya's choice of decals for the seat belts! But that's Tamiya for you! They do in plastic what no other company can dream of, but they give you seatbelt decals in 2018 instead of some photo etch. Kit still looks insanely good. Just looking at the parts and directions today, this Tamiya kit is engineered better than any 109 kit I've ever seen. In the centerline of the engine compartment is a bearer for the engine parts. No more misaligned engine. The centerline MG151 is modelled so that it actually resembles a cannon. The horizontal stabilizer is modelled in one complete part, so no more drooping stabs. Instead of the usual square-peg/square hole for the landing gear legs, the landing gear leg reaches deep into the belly of the 109 in a notched-L arrangement. Flaps and slats are made to be positioned open in a natural way. Separate ailerons appear to be made to be in a fixed neutral position. But there are tabs so maybe there is a little room for wiggle. Tail wheels are molded with their struts. Single piece horizontal stab and fixed elevators. I'll show pictures as I go... But I ain't started, yet. In comparison, the Eduard kit seems to be in a more conventional layout with it's primary 'plus' is rivet detail. Gaz, see if the Eduard erla canopy fit the Tamiya kit, please. Interestingly, the Tamiya fuse is braced internally. Interior detail is crisp. I'm guessing you wanna use all of your leftover Eduard kits to make a G6Late or G14. Unlike most 109 kits there is always that joint that goes down the middle of the compartment aft of the pilot. Not with Tamiya. 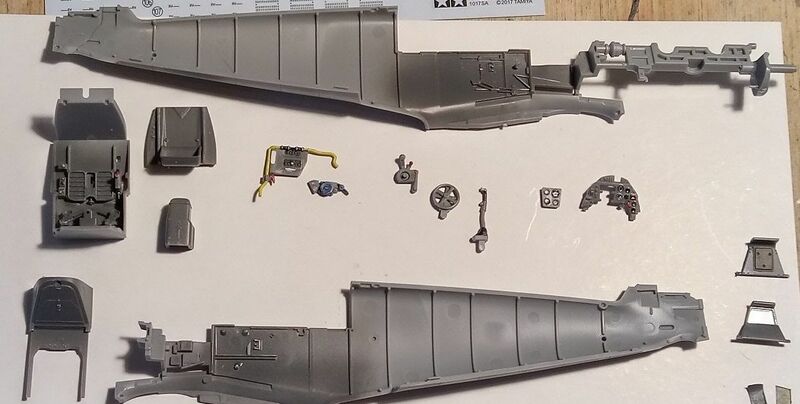 Part B25 (between the fuselage and the Eduard canopy sprue) has nice detail on it. Although both are built for notched canopy, each one has different angles. Easy to see that the gap is bigger at the top then at the bottom, and that some trimming would be required to make them fir at the base. Also noticeable is that the Tamiya kit is made to be in Trop or standard versions. Lookin' good so far Gaz. I picked up a Royal Class kit right after they came out and am looking forward to building it. Ah, Yes!!! Just what I was looking for. The Tamiya vs. the Eduard 109 G! 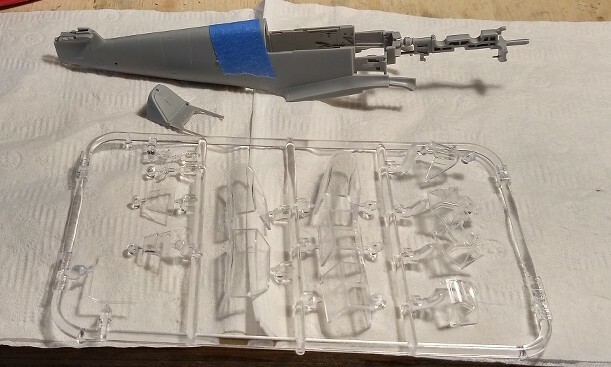 There are quite a few cockpit parts for a 1/48 bird. I've already attached the the yoke for the rudder pedals, rudder pedals, and seat bottom to the major floor and back parts. Painted everything RLM 66, and painted all of the controls whichever colors demanded by the call-outs. The IP comes in two parts and with two decals. Unseen are the two different Revi gunsight options. At the far right are your two canopy armor choices. Additional details will be need to be painted on the IP before I assemble it all. I don't why Tamiya didn't make a decal for the entire front of the two-part IP. This kit doesn't have Galland Hood, or tall tail options. So, you're pretty much restricted to an early or mid G6. The only flaw I've really noted are some very shallow ejector pin marks on the cockpit side walls. They are so shallow that I didn't even see them before paint. There are some absolutely killer G-14 schemes out there. You're right about that. Seems like the closer the end of the war it was the crazier they got. I will be interested in the outcome. Nice start. Nor any other 1/48 scale model I've ever seen. It's breathtaking in its brilliance, and from every report I've seen to date, it literally builds itself. I have one here to get started on soon.